So the holiday was amazing but you slightly overdid it? No matter what kind of travelling you are doing it can be difficult to eat healthily. One of my favourite things about travelling is enjoying all of the yummy food available so sometimes it’s nice to let loose and eat all of the things, and worry about it when you come back. after too much drinking, partying and generally over indulging and get back to normal. You can follow this advice just as a 7 day detox (even though I hate the word detox to be honest) let’s call it a ‘healthy plan’ or work any tips you get on with into your everyday life. Oh alcohol, so bad but so good. For at least 7 days you’re going to have to say a big fat NO to alcohol, liquid calories are not what you need right now, sorry! If you have to go to an event such as a friend’s wedding in those 7 days where you would really like to take a day off and have a little tipple then stick to clear spirits with a diet mixer, so gin or vodka and slimline tonic with a bit of lemon or lime. Goodbye also to fruit juices (that you haven’t just freshly juiced) and fizzy drinks, if you can wean yourself off of these forever so much the better as again, empty calories, chemicals and not that great for your teeth. Also cut down on the coffee and tea, limit yourself to maximum 1 or 2 a day with caffeine and stick to decaff the rest of the time , I won’t say remove that entirely as let’s be serious, coffee and tea are just the daytime equivalent of alcohol and without either to prop you up you’re going to be miserable and crying in the office toilet by 3pm. Instead, drink as much water as you can (I know, it’s boring). Tips to drink more are to put a litre bottle on your desk and bedside table and try to drink a glass or a few swigs once an hour. I try and drink 2 litres a day and do this by having my first glass at home with my omega 3 tablet in the morning and another when I get to work with one of those berocca or vitamin c fizzy tablets added. Then I take a 750ml bottle when I go to the gym and try and drink it all, and then if I am slacking on the water drinking I will make sure to have a glass ever hour on the hour so I don’t forget. 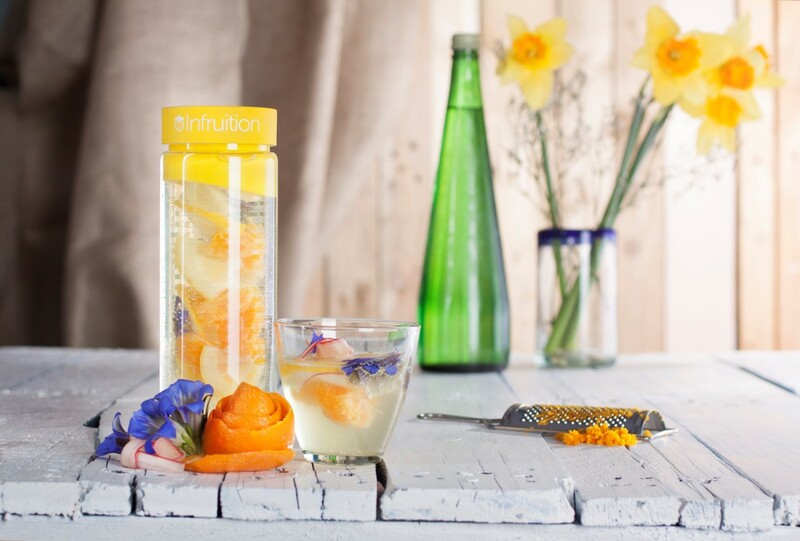 If you really hate the taste of water you can add some slices of lemon or lime or use one of the water infusers such as an the one by Infrution. I’m not someone that really likes eating breakfast on weekdays very much so it works well for me to replace my usual porridge with a smoothie or protein shake and, if you find a recipe that you like, you can enjoy this just as much as having a milkshake for breakfast. alkalising your body which is a really good thing, or just have some lemon water along with your smoothie. Find out more about how great lemons can be for you fromthis website. As you’re just having a liquid breakfast you might be getting a bit hungry by lunchtime but try and avoid stodge and stick to Soup, Salad or Sushi or a combo. Avoid things that are fried or processed and try and get some protein to keep you fuller for longer. Make sure that you pick items that you enjoy so you don’t feel like you are depriving yourself. Avoid creamy dressings, croutons and sushi filled with anything fried like katsu chicken. If you’ve got jet lag then by the end of the day then you might be half asleep. If you have the energy, slow cooking a big pot of chilli that you can then have with microwave rice for a few days that week when you don’t feel like cooking is a great idea. I use quorn but you could use turkey mince or lean mince beef if you prefer. If you really don’t have the energy then I’d suggest a ready meal or prepared soup or salad. Rather than buying nothing and ending up ordering a take away. Marks and Spencer have some great calorie and portion controlled ready meals and pre-made salads. The best foods to eat to reduce your current cholesterol level are fruits, and vegetables. If you’re bloated from a flight try drinking dandelion tea, this stuff is amazing at reducing water retention. Dandelion also stimulates the liver which is the organ that detoxes your body naturally. It’s very cheap and available from health food stores and supermarkets. Is also the main ingredient in a lot of ‘detox’ teas around that cost £20+! You can replace condiments with fat free greek yoghurt. Try it mixed with tomato paste, garlic puree, chilli sauce or srirancha. Add herbs and spices to make plainer food seem more interesting. The worse part of any type of healthy eating is feeling bored and deprived. Let’s be honest an apple isn never going to be as exciting as a bag of milky bar mini eggs. Being prepared with snacks in your desk drawer, handbag or cupboard will help you when hunger strikes. It depends what your tastes are, perhaps you like fruit, nuts, rice cakes, houmous and veggie sticks etc. Whatever you prefer stock up and keep them in Tupperware pots or ziplock bags. This will help you resist any offers of sweets, cakes or crisps. Pick an amount of time that you feel manageable per day. Perhaps that’s only 10 minutes each morning on a walk to the station. 10 minutes dancing about or running about with your kids etc. Aim to do this every single day. It’s about making sure you’re moving about and burning a few extra calories a day. I am going to the gym for 30 minutes 4 days of the week. If you can afford it, treat yourself to your favourite spa or salon treatment like a pedicure or a massage. Check if your gym membership includes a sauna and a jacuzzi. Alternatively, give yourself an at-home pedicure or manicure. Try and medidate or listen to some relaxing music just to give your brain some down time. Sleeping is good for weight loss! Many studies (including this one) have shown that being sleep deprived can lead to weigh gain. So if you want to lie-in or have a nap – do it!